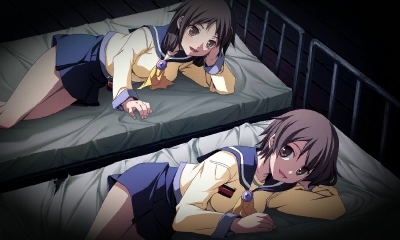 It’s no secret that the original Corpse Party is an older horror game. The latest entry in the franchise is a polished version of that release and retains the original’s overall aesthetics and mechanics. What’s fascinating is that, 20 years later, Corpse Party is still a textbook case on how minimalist game design can trump titles with bloated budgets. In a genre as intricate as horror, that’s no feat to mock. Related reading: This game is a re-release of the original Corpse Party. Matt has reviewed the most recent new entry, which landed on PlayStation Vita last year. 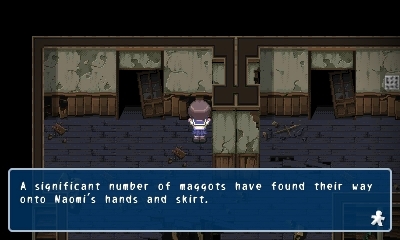 At first glance, Corpse Party appears to be fresh out of RPG Maker’s digital oven. It was exactly that on its first release, in fact, and this enhanced port doesn’t care to apply a façade by sprucing it up too much. Conventional wisdom says executing a dark and terrifying atmosphere in 2016 with the limitations of big-headed sprites and flat 2D tiles would be a Herculean achievement, but that doesn’t stop this one from being thoroughly upsetting. The story’s tragic events largely take place in Heavenly Host Elementary School, a dilapidated academy that exists beyond dimensions. After a class at another (normal) school perform a farewell ritual for a lass who is transferring elsewhere, the many student protagonists and their teacher suddenly find themselves somehow transported from their own familiar school to Heavenly Host, which is slightly less modern, so to speak. By this I mean it’s a broken-down mess loaded with wandering apparitions. Human skeletons and mutilated corpses beyond recognition are ordinary sights and typically the least daunting forces you’ll have to worry about. As the children frantically search for an exit from this pit of despair, the mystery behind the school and how they wound up there gradually unravels. The player is tasked with piloting these adolescents through downright miserable scenarios littered throughout the school’s rooms and hallways. Typically this entails solving barebones “puzzles” like finding a key in one room and using it on a door or stepping in the right spot. Yes, despite this game’s RPG Maker origins, the one thing you won’t do is face danger as an equal in some kind of turn-based skirmish. Whereas “survival” horror titles of the same period like Resident Evil granted the heroes great agency to dispose of threats firsthand, Corpse Party recognises its protagonists are vulnerable children, ill-equipped to deal with the paranormal. The game is hesitant to let its students fight back with anything other than the haste of their footsteps or quick wit; the most realistic, human response to such insurmountable hazards. Some have claimed Corpse Party would be better off converted to a more conventional visual novel format given how limited the player’s input is and there’s definitely an argument to be made there. For the most part the exploration is pointless and you'll need to follow through each chapter in a specific order, aside from a very few dialogue decisions to make; which sounds just like a visual novel, correct? However, I felt the horror theme was heightened by the act of wandering and experiencing decisions with consequences. If you mess up, the cutesy little avatar you were just manoeuvring will feel the initial pain of their death for all eternity, never to find comfort in the afterlife. No pressure or anything. Alternate chapter endings are based on authentic, movement-based reactions to specific situations. As a side note, the 3DS iteration has an edge over past releases in that there are new endings and extra chapters. I find the on-foot exploration, however limited, actively reinforces Corpse Party’s effectiveness as a horror game. When your character inches forward he or she does so one tile at time on a fixed grid. There’s no spineless tiptoeing like a 3D game would permit, you can’t shuffle in the spot to readjust yourself, and you certainly can’t speed up. That sounds oddly stifling for a horror game, yes, but there’s something so very pure about it. The deceptively barebones 2D overhead presentation lets the player perceive the world around them and grants time for dark thoughts to marinate. On the other hand, juggling multiple save files in a movement-based game where death is plentiful doesn’t make for a riveting game. This is almost a necessity unless you have outstanding intuition or happen to be glancing at a walkthrough (which somewhat neuters the suspense). It is quite possible to step on the wrong spot and, without warning, be saddled with a “Wrong End” from which you cannot return without resetting the chapter. While this is an artificial design choice for conventional games and ultimately makes Corpse Party less fun to “play”, it does seem that this frustration was intended to have meaningful implications. A save slot’s eternal state of failure represents what the characters themselves experience when you botch something. In theory, it means the player’s intuition is relevant to every situation at hand; wandering willy nilly may well cause the character whose actions you’re directing to get killed. The upside is that this enhanced 3DS version lets you skip entire scenes of dialogue so catching up doesn’t take eons, but it is still more chore-like than it needs to be. Yet all of this is made up for with Corpse Party’s unforgettable vision of horror. Here you’ll find less emphasis on jump scares or visual gross outs. Revolting illustrations occasionally accompany the dire occurrences, yes, but they’re used sparingly enough to retain their effectiveness throughout the game’s running length. This title’s real claim to fame is its scriptwriting. Terror in life stems from a combination of rational and irrational forces. Being covered in insects on an episode of Fear Factor might not kill you, but that doesn’t mean the human psyche is equipped to withhold its protective instincts without preparation, fortitude, and motivation. Then there’s the paranoia directed at the unknown, which says the moaning and erratic movements of a shadow are sure-fire signs that The Walking Dead’s depiction of zombies is real…but you can’t prove it without checking. The most petrifying force for many would be an unexplainable one that represents an active threat to your wellbeing; one you’re not certain it can be evaded. 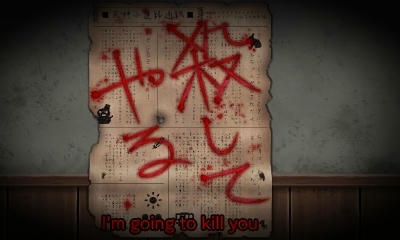 In Corpse Party, there’s no way to calculate such fears because every hallway is so damaging, agitating the students by forcing them into contact with a myriad of possibly safe but relentlessly vile fears. This puts both a mental and physical strain on the characters so that losing sanity feels inevitable. Having dozens of uniquely rancid items spread around the hallway is not going boost that confidence level. Of course, the disgust is felt more by the on screen avatar than the player, who needs to be sympathetic for the true dread to start taking effect. 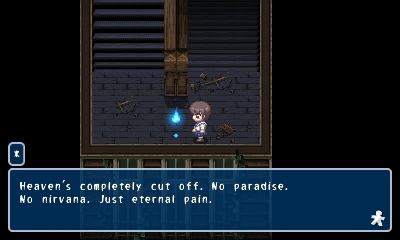 Corpse Party is rooted in heart wrenching tragedy perhaps more than trepidation. Strewn throughout the game’s rooms are notes left behind by the deceased. To give you a “taste” of what these scattered notes entail, one very early on relates the story of two starving friends, who play rock, paper, scissors to determine who gets to eat the other. The description escalates that already morbid concept into a far more harrowing one using descriptive verbiage. You get a breakdown of texture, taste, and smell. The surviving party goes on to carry that friend’s eyeball as a twisted memento of sorts and describes the experience of holding an eyeball in detail far more vivid than I ever banked on discovering firsthand. Watching one of the more confident students be completely stripped of their ability to act in tight situations in the dark as their mouth fills up with dirt isn’t much better. It’s the perverse concepts that cause dread to linger in the player’s thoughts. Depression and discomfort are equal forces that collectively snowball into something traumatising on a deeper level. Choice words can be just as soul crushing if not more so than a visual medium, which is perhaps why the game is so successful at achieving its goal. 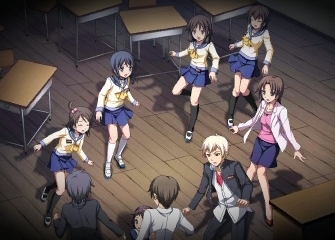 Whereas jump scares elicit a momentary shriek and fade away, Corpse Party’s distinctly eastern sense of horror is like being probed directly in the brain. It’s just delightful, then, that this game gives meticulously detailed descriptions for everything down to the bucket of maggot-infested human meat just lying around. Some of the most gruesome moments have no accompanying image on the screen, just voice acting and dialogue to really let the imagination go into overdrive. In addition to the clever writing, expertly chosen sound effects are able to trigger appalling mental images. Whether it’s a sudden atmospheric shift, the swap from an eerie track to dead silence, or a particularly spot-on voice performance, they’re all ghastly. Corpse Party does plenty overall that wouldn’t be achievable through a book or through the limitations of a film but makes use of similar storytelling cues. The depictions of violence are less important than how they happen and who they happen to. The characters have likable personalities, real ambitions, and moments of comedy or fanservice that make the thought of their passing rather jarring. The differing perspectives of each student and the unravelling mysteries make each subsequent chapter more thrilling than the last. Watching them slowly lose themselves to fear, both related to the horrific circumstances and in life itself, is dismal. Suicide (a very realistic outcome to what the characters are witnessing) is just exasperating to watch as the actual threats. 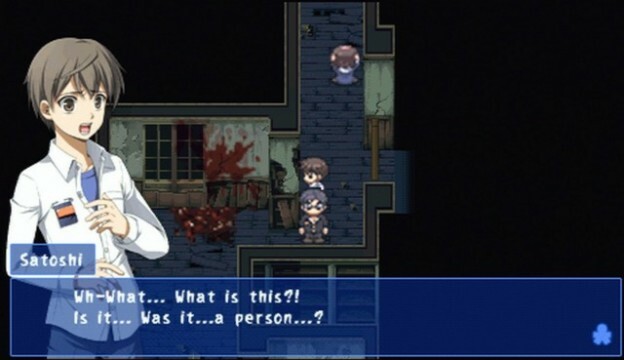 You will find yourself genuinely concerned for their safety…which, of course, is part of what makes Corpse Party’s cruel tendency to play with their mental states so successful. Related reading: We have a massive interview feature with one of the legends of Japanese horror cinema about what makes Japanese horror different (and better).